Spent hours before my birthday with an acoustic jam with Alfa, and I must say that it was one of the memorable night I've ever had. With her alluring voice and a multi-instrumentalist, Alfa goes back to her Pinoy roots to make her "kababayans" hear what she got. And can I just say that she's really amazing, inside and out. Last September 3, Alfa serenaded her guests at Le Cafe Curieux in Makati. Meeting her, was a breath of fresh air, she's a pretty girl with a pretty voice. I may not know the lyrics to her songs, but I can almost see her soul into it. Born in the Philippines to a family of musicians, Alfa got an early start in piano and violin, playing nationally with the Children's Orchestra Society of New York. 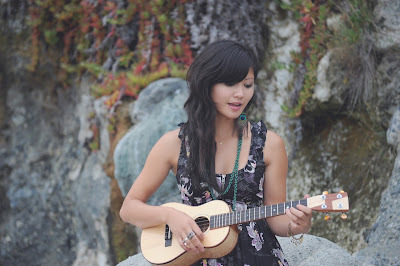 Alfa's music has received honorable mention from the New York Songwriters Circle and won Grand Prize at Kollaboration Acoustic 2009, a competition highlighting Asian-American talent. We had the chance to hear her songs from her latest album, "World Go Blue". And did you know that it has climbed US radio charts including the CMJ Top 200 and the Top 100 College Radio Chart? Cool right? Get a copy of World Go Blue now and hear how amazing and preppy her songs are. I am definitely loving Blue and Missed Opportunity these days that I always listen to it when I feel down. Know more about Alfa in her official website at http://www.alfa-music.com. You can also follow her on Facebook, Twitter and Youtube.